Back at Bones' shop, we had work to do. Jerry, Bones, Matt, Ken, and I tore into the project of making Bones' shop a more inviting retail space, and one that would get more people out on bikes. We unpacked four big boxes of parts and accessories that we were donating to Bones and that were such a nightmare at customs. 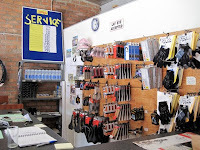 We used them to fill the racks behind his counter space and under the service counter, neatly presented and organized. We also went through pricing with Bones on all of these items, striking balances between what the local people could afford and what Bones needed to make to keep the lights on. As we worked a very tall man came in with a very big bike. He introduced himself as David and we quickly learned that he is someone we had been emailing with for several weeks. 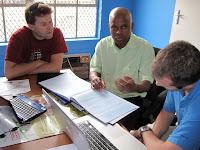 David is an American who is living in Gaborone with his family and working on aid programs for several months. 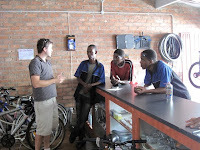 He was an early customer of Bones', and he gave us an idea of what it was like to bicycle for transportation in Gabs. 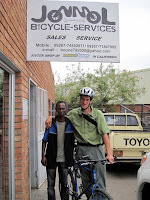 He assured us that it was more than viable to get around on a bike, and said that after getting a child seat from Bones one of the best experiences he has had in Gaborone is that of riding around town with his son on the back of his bike. He says that no one here has seen this and people fall over themselves to look and smile when they do. Then it was bike time. 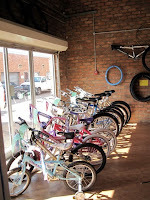 We wanted the bright space at the front of the shop to have an enticing display of the bicycles in Bones' inventory, looking like they were eager to take their new owners to work, to school, or to health care by dicing through the traffic jams and leaving frustrated drivers in their wake. We set to cleaning and tuning every bike Bones had for sale. We installed kick stands and lined them up with price tags clear as day on each one. While we were in the middle of this, Boz stopped by for a brief visit. 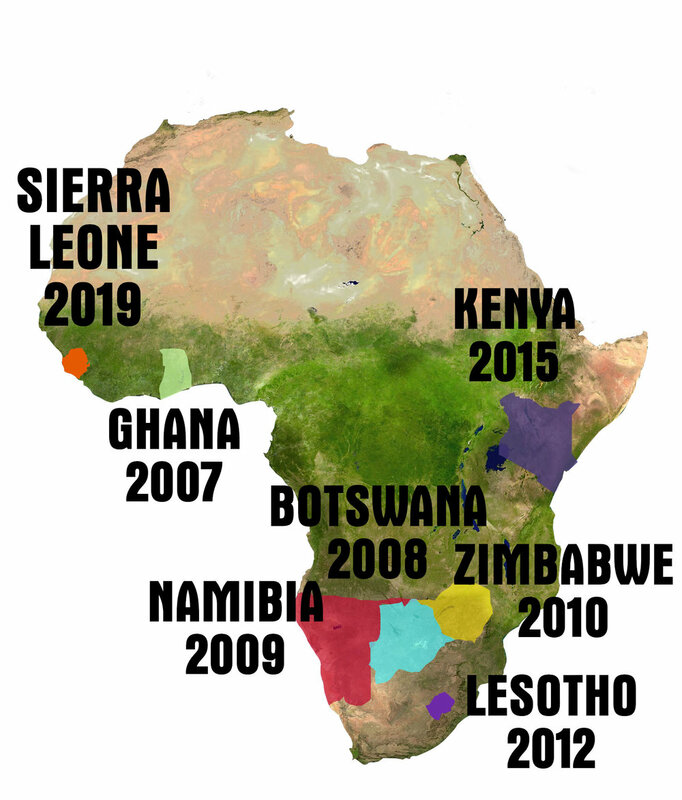 He was a contracting consultant working for the government of Botswana with the purpose of finding worthy and viable local businesses who would sustain themselves, grow, and most importantly to the government, employ local people. Bones' shop was a natural fit, and Boz sat down with Matt and Ken to show them the methods in which he was training Bones to deal with the financial side of Jonmol. We were impressed that cost of this federal program, which was covered primarily by the diamond industry, was being used in what seemed to us to be the perfect way. To mentor local businesses, help them find success, and create jobs for the people in their communities. We found Boz and his methods for training Bones to be top-notch, and may even work with him directly to find future candidates for Mike's Bikes Sister Shops. The final thing that happened that afternoon at Jonmol was a pow-wow with the entire crew. Matt led the discussion and it focused on the importance of good service. He stressed the fact that every bike on the sales floor needed to be perfectly tuned and presented, saying that these bikes should be so good that the Jonmol guys would "want their mothers to ride home on them." Best practices were discussed with regard to repair services, and then finally some grassroots marketing. We dropped off 2000 stickers with the Jonmol logo and contact info for the guys to do a little guerrilla marketing. 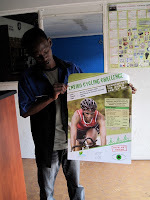 We were thrilled to hear that Jonmol had already organized and sponsored several group riding events, including the Enviro Cycling Challenge which benefitted a local charity and apparently had an overwhelming turnout. In the some of the short remaining time before we bid farewell to Bones and the boys at Jonmol, we discussed ways that they could push these grassroots efforts even further. Not only would this show of public bicycle force promote their own business, but it would help make the bike become more 'cool' in Gabs, and in time might help the people of Gaborone to understand the freedom, mobility, and simple joy that only a bicycle can give. Bicycle retail 101. Or maybe 37.